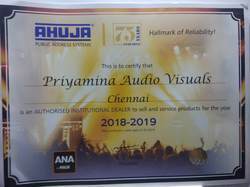 Incepted in the year 1985, we Priyamina Audio Visuals are one of the leading manufacturer and supplier of audio visual equipment, public address systems, multimedia projection screens, portable public address systems, interactive board, interactive slate, classroom podiums, multimedia conference systems, audio visual equipment, multimedia projectors, overhead projectors, conference systems, portable pa system, ceiling kits, conference systems, language lab equipment, writing and display boards, projection screens etc of brands like Ahuja, Studio master, Panasonic, Optoma, Epson, In focus, Liberty, Cini Lite and eBeam. 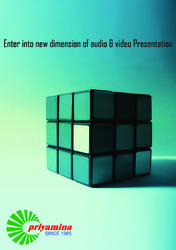 We welcome queries for Audio Visual Equipment from South India region including Andhra Pradesh, Karnataka, Kerala and Tamil Nadu. We have a team of highly qualified engineers who are always ready to help customers regarding their technical queries, programming along with their training. Moreover, we also provide value additions services such as after sales support and rental services to our clients. Our warehousing and packaging experts ensure that our range reaches without any defects at our clients end. Under the able guidance of our mentor, Mr. Muhammed Kassim, we have been able to constantly reach the pinnacles of success. His rich business acumen and vast knowledge has enabled us to carve a niche in the market. 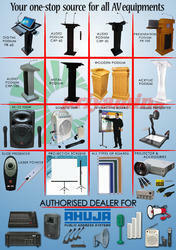 Trading of audio visual equipment, public address systems, multimedia projection screens etc. Ahuja Authorised Dealer certificate for the year 2018-2019. Moreover, we also provide after sales and rental services to ensure complete satisfaction of our clients.